Another purpose-designed application system developed by Impresstik Systems, Deco-Seal™ is a unique machine that enables cork-top decoration (using standard corks). 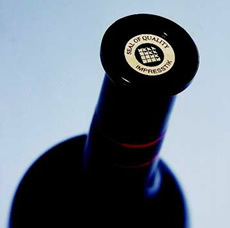 Introduced in response to the growing trend in some countries for ‘flange-top’ wine bottles instead off conventional bottles using standard using standard capsule seals, the system applies a decorated disk at high-speed onto the top surface of the cork immediately after insertion. The Deco-Seal™ disk uses dry-peel technology for dispensing purposes, with adhesive application incorporated into the applicator head. The first customer for the concept is Chile’s largest wine producer, the Concha y Toro winery, with the Deco-Seal™ component produced by Impresstik’s Chilean agent, Toprint. In Australia, the complete system is available from Impresstik as another ‘total package’ solution.